A Business need not be only a commercial activity, it can be a person's regular occupation, passion, profession, trade and much more. On that note, Do you have a business and don’t have a website? If you said yes, it’s almost as if your business doesn’t exist. Planning a website is like planning your life, it's a replica of your Life. Make your own website. Your career will later thank you for it. 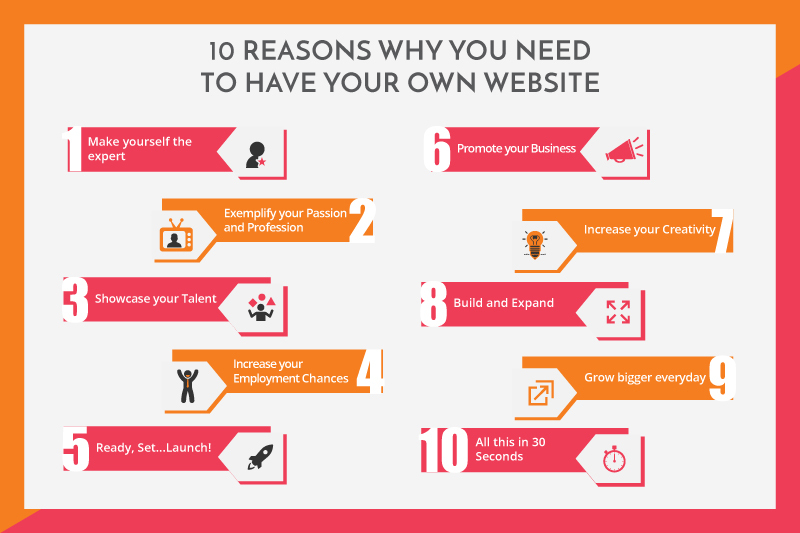 Here are the 10 reasons on how a WEBSITE can help you! Art is not what you see but what you make others see. Because, how you view yourself is different from how others view you — having a website is your public persona. So digging deep into what you think yourself as and the way you represent it to your potential clients makes you a CHAMP. A Website turned into your digital resume accelerates your career development. Prospective employers and recruitment agency take advantages of the internet to do the initial search for job applicants’ information.They want to know more about the applicants, their skills, passion, and life. Having a great website will greatly increase the chance of being selected for an in-depth interview. It’s about providing professional information to people who are looking to find the best candidate for the job. 3. Got Talent? Then Showcase it right away! You can create your true brand through the topics you chose, the style of writing, the design and usability of the website. Though free hosted blogging platforms like Blogger.com and WordPress.com also provide you the same channel for free, your personalization options and control are often much limited. Your website and blog should show the best of you! 4. To increase your chances of employment! Getting to the number 1 or first-page position speaks volume of your web skills (e.g. SEO, content strategy, etc.) and your knowledge about online reputation management, both are highly sought after skills for most employees in the 21st century. Having your own website is like posting your resume everywhere. If you would like to work in a web startup, do establish yourself online! Your website provides the best platform for you to show would-be employers the topics that interest you. but the important thing is to represent yourself professionally, no matter how you chose to do so – that’s what matters. 5. Ready, Set...Launch Your Business! As long as you allow search engines to index them, whatever you put up on the internet can be and will be seen by others. This allows you and your website to reach people you would otherwise not meet. Now that’s what I call a good business start. 6. An Effective way of Promoting your Business! It’s expensive! Investing in advertising is necessary, but it takes a lot of money. Less Expensive, environmental friendly when it comes to advertising and marketing through your website. Having a website will make promoting your company less expensive. It’s not about your profile being interesting — having a personal website is much more than that. You get to learn a New Trade by Doing. You tend to get more creative with the own website. A website is a 24/7, 365 days a year storefront; and it’s accessible from anywhere in the world. It’s worldwide! It is relatively easier for a new person to get to know about you and that gives a boost for the connections you might likely gain. 9. Grow Big Every Day! Having a personal website is a way to build a dream brand which is really important in today’s world. Frankly speaking, having just the website is not enough to build you dream brand. You’ll have to focus on having the presence on social platforms wherein you can put your views. Platforms like quora, Reddit are good to start with. You need to Produce quality material probably in terms of blog or videos in skills you are good at or passionate about. Don’t forget to put videos on youtube. Keep up to date and clean Linkedin profile. Although coding skills are helpful in creating a website, they most certainly aren’t necessary. It really depends on what route you want to go to your website. Perhaps you have a lot going on and in addition to not knowing much about creating your own website, you also are very short on time – this is probably a situation a lot of us are in. When I built my self-hosted WordPress site, it took one dedicated weekend. But it probably wouldn’t even take many of you that long. In fact, the actual “building” of the site shouldn’t take more than 10 minutes. So what’s stopping you from creating your own website? You Are Missing Out a lot By Not Creating your own Website. Your personal website is vital but it should change and evolve. Many web developers might be an expert in only a language / an area of web development as they concentrate their efforts in that area only. However when building your own website, you need to understand every aspect involved, from domain registration, hosting, web design, front-end coding, back-end coding, usability, search engine optimization, conversion optimization, you name it. Create My Personal Website Now!